Travel bags are a necessity if you are on the run. Wouldn't it be great if it were always easy to find your bag at the airport or when you travel? 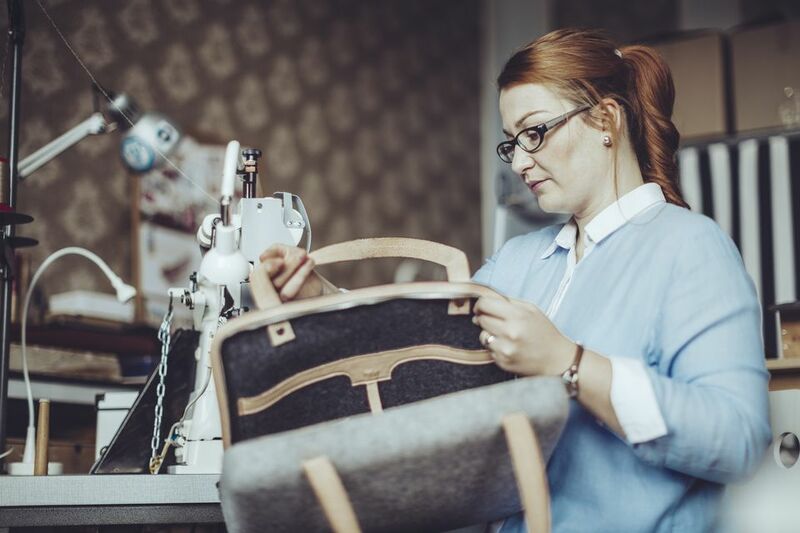 By sewing your own bag, you can have a special bag that is all yours and no one else will have one just like it. These free patterns will guide you through making your own unique bags. A Gym Bag with Interior Water Bottle and Sneaker Pockets. This bag includes directions to sew in a shoe holder which will keep your shoes separate from your other belongings, whether it's for a trip to the gym or a weekend getaway. 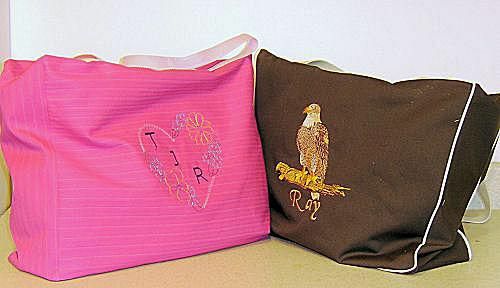 Use machine embroidery or other embellishments to make this bag unique and original. A simple tote bag can take care of almost any need. Vary the size to make the perfect bag, smaller for shopping or large enough to carry your largest rotary cutting mat to a sewing class. Keep a couple in your car to have handy for groceries and more. This bag is a perfect toss-in-the-trunk-and-go bag for a weekend or an overnight getaway. The soft sides make it easy to "stuff" in the bus or truck without ruining the bag. You can even make it a makeshift pillow on a camping trip. This simple tote bag is made with two fabrics and has handy pockets outside the bag to keep things like your car keys or baby toys handy. The pockets are on all sides of the bag, helping you keep things organized. It's easy to change the style from beachy to floral to two-toned by your choice of fabric. This free bag pattern creates a bag that is large enough to hold a weekend's worth of packing. It has a recessed zipper in the top to keep everything secure. Make it with solid durable fabric or find a wild upholstery fabric to make it stand out from the crowd. It's perfect for a carry-on to keep your essentials handy without worrying about them spilling out. If you're heading for the beach or pool. make one of these bags for the wet stuff. Because the bag breathes, you end up with less mildew if you forget to hang the wet bathing suits and towel out to dry. If you are at the beach, the screen can sift out the sand before you put the bag in the car, rather than dumping sand on the floor at home. This is a great way for the kids to carry their own belongings without them being left behind. The size works out as a perfect camera case too, so you may want to use mass production sewing methods for this handy fanny pack. A simple string back pack is the perfect solution to have your hands free for a day at the amusement park or any event where having your hands free adds to the experience.